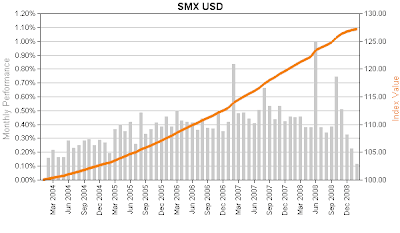 The SMX is made up of publicly listed global fixed income funds that invest primarily in microfinance. Funds are weighted in the index according to their total assets, and they must provide monthly valuations and use U.S. dollars as their investment currency, in addition to having a valid ISIN market identifier. Index values are indicative of the growth of microfinance assets held by the funds. The index value of 100 for January of 2004 is the baseline for performance measurement, and each additional point is equivalent to one percentage point of growth across the microfinance industry. The index is revalued during the first week of each month and is not adjusted for inflation. Symbiotics SA, Information, Consulting & Services is the Swiss firm that publishes the index. Symbiotics main line of business is microfinance investment intermediation services as well as other services.